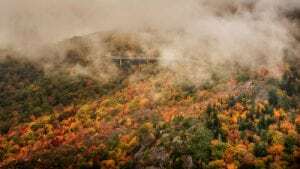 You have visited the North Carolina High Country in the Blue Ridge Mountains and have fallen in love with the gorgeous natural views and mountain way of life. Is it time to pick up and set roots in the area? The friendly and experienced folks at Antler Realty would love to help you and your family, whether that be you and your spouse or your family of four young children, find your next mountain home. Our commitment to you begins with your first phone call, so give us a ring to start finding the best deals on houses for sale in Linville NC! Summer fun is always just a short drive away in the High Country. Sweat and then cool off at Linville Falls, the waterfall with the highest volume of any waterfall on the Northern Edge of the Blue Ridge Mountains. Experience “true darkness” in the wondrous Linville Caverns, just south of Linville Falls. In the fall and winter months, you may be able to view the caverns’ popular furry residents – the tricolored bats and little brown bats. Avery County, home to Linville, NC, is home to three world-class resorts that offer fun for the whole family. All three are just a short drive away, making the holidays and winter full of fun and cheer. Regardless of which resort you choose as your favorite, Antler Realty will help you live close to the winter fun by finding you the perfect fit out of the houses for sale in Linville NC. Sugar Mountain Resort is home to 125 skiable acres with eight lifts and the longest run in the area of 1 ½ miles. Beech Mountain Resort is the highest ski area in Eastern America and is proud to feature 95 skiable acres. Visit Beech Mountain Brewing Company for fresh beer and visit the sky bar for food and beverage service…on top of the mountain! Families looking for the best snowtubing in the area are recommended to visit Hawksnest Snow Tubing, the largest snow tubing park in North Carolina. Four different snow tubing areas provide a variety of terrain to satisfy tubers of all experience levels! At Antler Realty we handpick our sales staff based on their enthusiasm, experience and strong work ethic. Whether you are looking for a cabin on your private corner of the mountain or along one of the area’s pristine golf courses, we will carefully listen to your objectives and pinpoint your family’s needs. Live in the beauty of the High Country. Let the friendly folks at Antler Realty guide you through the gorgeous yet reasonable array of houses for sale in Linville NC. You have visited the High Country…is it time to stay?